"Squirt Guns? I don't know nothin' about no squirt guns, officer. Honest! I ain't seen any." We might not admit it to curious cops, but we all know they were there. The Gangsters tournament had more squirt guns and more shootout losses per game than ever! 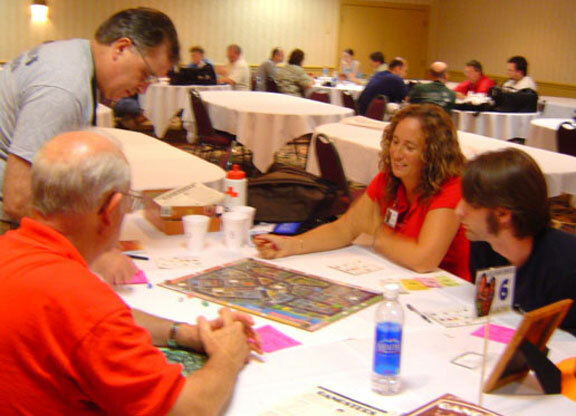 There are two types of games at the World Boardgaming Championships -- those with squirt guns and those without. We know which kind we prefer! Now we just need to start infiltrating squirt guns into other events. I hope you had as much fun as I did in the first Gangsters tournament in Lancaster, Pennsylvania. The big ballroom meant lots of commotion, lots of noise, and lots of excitement. Since the cat is already out of the bag, I'll let everyone know—next year I'll provide souvenir plastic fedoras for every player. Bring your squirt gun from this year, and you'll be all decked out! I'm looking forward to it. Thank you for joining the mob this year. Let me know what you think and how we can improve for next year by returning the survey. See you next year! Notes: 1) The Final has never been won using a cash strategy more than three years in a row. If the pattern holds, the 2006 Godfather will win with 10 joints or a monopoly! Ten joint and monopoly wins are near, but not quite at, their highest levels this year (36%). 2) Winners continue to be seduced less often and take fewer hits than everyone else. If we're “beating up on the leader” wouldn't the reverse be true? It stayed “Dusk” all year. Nick “Dusk" Henning proved that last year was no fluke by repeating his Championship. Our two-time Godfather played a perfect Sneak-up-the-Cash strategy that culminated in $11,400 after 14 turns. Interestingly, Jim “The Instigator” Castonguay repeated his second place finish while Robert “Bobby Tweaks” Buccheri moved from third to fourth. The lone player in this year's Final who didn't play in last year's final was Nick “Slumlord" Smith. 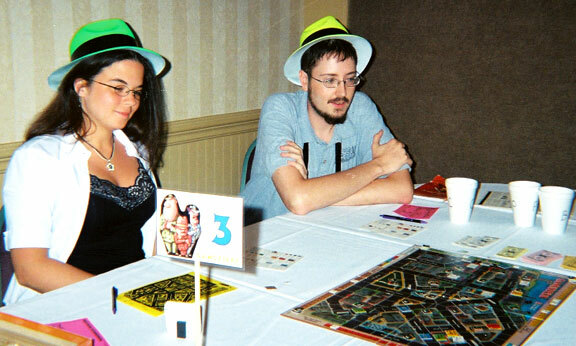 Unfortunately, three-time Godfather Pitt “Sluggo" Crandlemire was injured just before the World Boardgaming Championships and was unable to attend. Although this brilliantly masterminded coup allowed the rest of us to have a shot at the title, I remind all criminal masterminds to limit their diabolical deeds to the gameboard in the future. Cement Overshoes Sportsmanship Award ­ Our winner of this year's all-expense paid trip to the bottom of Lake Michigan is Charles “Side Step Stucker. Side Step took extra-ordinary measures to make sure he didn't have an unfair advantage in his game during the third heat. At one point, he gave advice to another player and then voluntarily pointed out the $500 kibitzing penalty when no one else realized he needed to pay. Later in the same game he realized that he'd been given $1,600 too much cash for payout and returned the dough. He's so honest I'm not sure if we can call him a gangster! Side Step is one more reason Gangsters is a great tournament -- we have many great individuals sitting on the other side of Chicago. Thanks, Charles! Many thanks to Joel “The Chair” Tamburo who received his first nomination and to Nick “Slumlord” Smith who received three nominations! The game is a lot more fun because of players who go out of their way to ensure their opponents are enjoying the game. Thank you and thanks to those who pointed out the good deeds of their opponents! 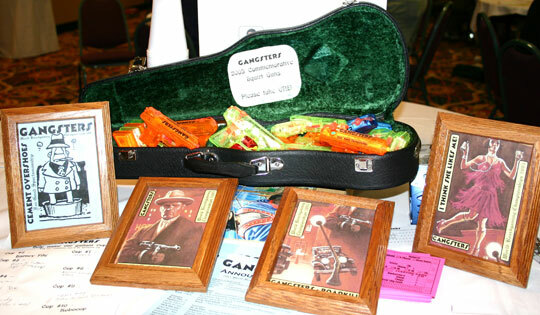 Junior Godfather Award - 37% of this year's entrants were eligible for the prize for the best new player. Among those who just learned the game, Jeff “Pork 'n Bears" Bowers, Don “Foot Long” Chappell, and Scott “The Zoo” Bowling made it to the semifinals. Scott “the Zoo” barely edged Don “Foot Long” with tie-breakers of 56% to 50% to become this year's Junior Godfather. We hope to see all of this year's new players back next year to give this year's sophomore class a run for their money (not to mention their hideouts)! "I Think She Likes Me!” Award ­ This year's class of Vamps was second only to last year. Our winner lost an amazing ten gangsters to rival seductresses. That really hurts because it feels like your money is going to recruit mobsters for the other gangs! Ashley “Angel" Collinson kindly helped all those other gangs during her attempt to re-qualify for the semifinals in the last heat. She took eight hits during shootouts during her semifinal too. Obviously, we can expect that a little opposition will not be enough to stop this “Angel." Honorable Mention ­ As usual there were lots of interesting possibilities for this category which makes it a very tough choice. Chaka “Patch-Eye” Benson managed to acquire all of the Purple joints except one (Frankie's House of Cards) in his third heat. The last one eluded him for three turns. Gordon “Itchy” Rodgers, Robbie “Donut" Mitchell, and “Mickey the Wire” Buccheri played the closest game of the tournament. Each ended with assets valued between $11,800 and $12,500. Each had finished at least 88% of their objective Itchy pulled out the win in the end, but Mickey the Wire might have been the winner if he hadn't passed the coppers so much cash under the table! 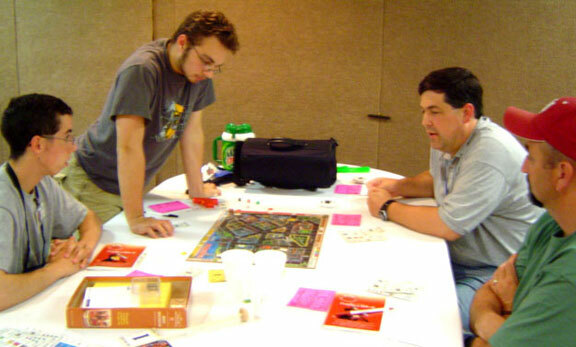 John “The Viper” Pack had the only Red monopoly of the entire tournament. He also had nine joints and a 7/1/3 gang at the time. Mark “Ladykiller” Love won without ever moving his Racketeer. Ladykiller was content to move the public into his fine, upgraded establishments every single turn. Not to be outdone, Robert “Bobby Tweaks” Buccheri won in the third heat on his third move with $12,400. The x3 Public pays three visits. Blair “The Plug" Morgen writes, “Two Turns???" Tom “The Duck" Vickery notes, “Ouch! Gang Warfare causes mass exodus through the Bus Station - 3 turns x Public x3 x Level 3." Andy “The Duke” Joy won the very first heat with 10 joints and $10,100 in cash at the same time! He made money even though he was spending it on new establishments! The Duke also finished in sixth place this year. Amazingly, this is the Duke's second straight sixth place -- just enough to get a team point but just shy of winning wood! Joshua “Radio” Ostrander sent the cops after Peter "Numbers” Staab's joint which was serving up illegal beverages to the public. Not only does Numbers have the bribe, but Radio can't stop another payout which puts Numbers over the top. Radio writes, “Great game -- a lot of fun!" Come back next year and radio for backup when trying to stop a Numbers racket! And, last but certainly not least, is our honorable mention winner for this year -- Ashley “Angel” Collinson. Back in 2003, Angel was part of the game that won honorable mention for a bizarre set of circumstances -- one of which was a player whose Racketeer was in the final joint needed for a Purple monopoly. This year Angel came up just one joint short of a Purple monopoly in the first heat and again in her semifinal game. But this is the year perseverance pays off. In the second heat, Angel became the only player in recorded tournament history to actually complete a Purple monopoly! And she did it in the year Ladykiller's excellent “How to Win at Gangsters" article was published -- telling players they can ignore such an unlikely possibility. Congratulations, Angel! Anyone up to the challenge of the first ever Green or Yellow monopolies? I didn't think it was possible, but the Downtown Bus Station was held by even more winners than it's record percentage last year! Nearly 40% of winners held the Bus Station at the start of the game! Everyone's favorite partner for the Bus Station, Brizelli's Riverside, was held by a third of all winners at the start of the game. The Ambassadors' Club (usually with Brzkowski's Imports) was the next most popular strategy—held by just over 30% of eventual winners. The top four joints haven't changed in the last three years! However, winners are diversifying a bit—this list contains only 71% of winner's starting joints while last year's top ten contained 76%. Even so, the the top three are more popular than ever. Taylor's Machine Shop was the most popular third wheel for the Green One-Jump strategy this year—zooming up from 32nd place last year to fifth place and taking ninth place in the cumulative standings. More than twice as many eventual winners picked Taylor's at the start. Westgate Hotel is also moving up the charts to 13th overall as a popular Green add-on (and the personal favorite of the Slumlord). Serva's Market—a good combination with perennial fourth place Greenwood Park—moved up to tenth place and improved in the cumulative standings to 15th. Will we see a resurgence of Sneak-up-the-Cash strategies revolving around the Park and Market? The Pussycat Club continues her long descent out of the over-all Top 10. The Purple One-Jump opening used to be as popular as the Green and Blue One-Jump strategies. However, the one-time second place joint has fallen to 8th as players have realized that upgrades are too dangerous in Vamp Central. Jaeger's Clothier and Belmar Theatre have seen their status as favorite add-ons drop as well. Jaeger's is a favorite of Red monopolists (of which we saw only one this year) while the Belmar is a lowly one-jump joint. Interestingly, all of the finalists start with just one Thug. Dusk begins with an extra Racketeer thanks to his cheap gin joints. That'll let him manipulate the Public but the early Public payoffs will favor the other players. The Instigator and Bobby Tweaks both have perfect one-jump sets for the Blue and Green strategies respectively. It's interesting that neither of the other players felt it was critical to break those sets. A big thank you to “Dusk” for taking notes throughout the game so that we could enjoy this snapshot of the final. Obviously, these clues don't tell the whole story, but they give us some indication of the ebb and flow of crime in the Windy City. Can you see how the game takes shape? Turn 1: “Well, that's a sh$%#y roll,” says Bobby Tweaks before he collects $1,200. The cops followed closely on the heels of that public—knocking down the Downtown Bus Station. Dusk collected $1,000 while Slumlord collected $1,700. The cash strategies are already in full swing. Turn 3: The Instigator comes up with $3,300 thanks to the Public x3 patronizing the Ambassadors' Club. A lot of money is in play. The public is lying in wait to corrupt Slumlord's Vamp. Turn 4: The crime rate is high (7). Dusk thinks it may be a short game. “All public is out chillin'." Turn 5: Cop #4 rolls the Instigator's Thug. “He is the man for the second time!" Side Note: The Bus Station is pure evil. The Public x2 moves from the Bus Station (x3) to the Ambassadors' Club (x2) to Greenwood Park (x2) to Westgate Hotel (x2). These folks have a lot of dough to blow on moonshine! Turn 6: A Public counter makes it to the Bus Station ... again. This time a Public x1 takes the exact same route take by the Public x2 last turn! “The Public are whores." Three cops are set up patrolling around the Bus Station (#5, 7, and 9). Turn 7: There are five cops and five crimes on the board at the start and end of the turn. No public payouts this turn. “Ha ha!” laughs Dusk. Turn 8: “Your wad doesn't even fit under your paper!" A public manages to enter a building again—Jaeger's Clothier this time. Lots of vamping. Barney Fife nibbles the Red Thug. Six bribes are owned by the players. Turn 9: Dusk opts not to whack a public in Brzkowski's Imports in favor of moving a cop nearby. Turn 10: Bobby Tweaks moves his Racketeer into his Level 3 Bus Station. “Uh oh." Four cops patrol in range of the Bus Station. The Instigator pays $3,000 to buy his way up to an 8 Thug army. Side Note: This game is all about the upgrades. Turn 11: Five cops can now reach the Bus Station. Turn 12: It's Vamp City. Poor Racketeers. Dusk is down to two! Turn 13: 8 Instigator Thugs annihilate one of Bobby Tweak's establishments—clearing the board of Public markers. Subsequently, Nick and Nick (that's Slumlord and Dusk) bring all four Public markers into play in order to stop the Bus Station. Turn 14: Cop #6 busts Bobby Tweak's Vamp. This is the second or third time this particular cop has hit Bobby Tweaks despite the two bribes he owns. Dusk takes his one move—putting the Public x3 into Huck's Marine (x3) to get to $11,400 and declare victory. Everyone was worried about the obvious one-jump joint strategies (as they should have since they were so successful in collecting money in the early going). But ultimately that let's Dusk sneak in with a less obvious cash collection strategy. In fact, Dusk only collect one really big haul—letting the other players believe he was no threat. Note too how Dusk refuses to spend money—even when his gang drop dangerously low on Turn 12. The bloodshed in this game was minimal—with only 8 total gang violence related losses—even though the players had ramped up the strength of their gangs in order to launch shootout by the end of the game. One very tricky aspect of Gangsters is the need to have your gangsters in play early enough to use them effectively. On the other hand, the Vamps were much more active with 15 total seductions. That also played into Dusk's hands because his gang looked weak and non-threatening after its losses. Just like last year, Nick shows that a player who patiently collects small payoffs while the attention of the other gangs is elsewhere cna pull off consistent victories. Dusk also collected some cheap establishments—just in case he needed a backup plan. In this case, he didn't need it. It's Dusk this year in Chicago! Will Nick be the second player to three-peat next year? Come and find out—and try to stop him! Congratulations on a stellar performance, Nick! The good news is that I still have copies available. The great news is that even though I ran out after the 2004 WBC, I've been able to obtain more without having to raise prices much. I have new, shrink-wrapped copies available for $50. I have used copies for $35. The used copies are all in good condition (most having been played just a few times), guaranteed complete, and in boxes that have nothing worse than minor shelf wear or a tiny crease. Unpunched copies (which I don't have at the moment) sell for $45. I charge a flat $7 for shipping within the USA. Email me for more details. I earn a small profit on each sale which I use on special awards, name tags, timers, and other goodies for the tournament. If you ever run into a copy that you don't buy for yourself or a friend, let me know. I buy them to keep the tournament well-stocked! Thank you! 8. See you in 2006! I hope you've enjoyed this newsletter! Come again next year and wear your Gangster pride on your head! For anyone who wants even more statistics and information on the games played this year, there's more (and more than ever) on my website: See link above. The complete and current errata/FAQ for Gangsters is at http://www.gameaholics.com/gsr_clarifications.htm.